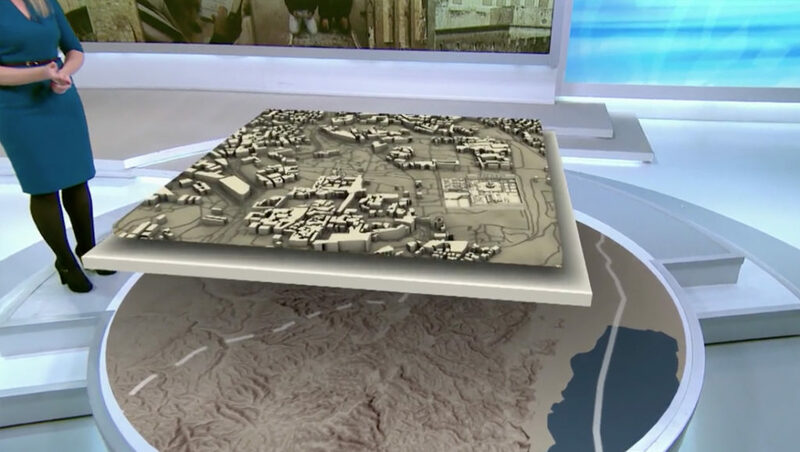 Al Jazeera English used an augmented reality layered map and buildings to explain the geographic and religious symbolism of religions that also has caused the region to become such a hot zone. The segment, created using Vizrt, using its Viz Artist and Viz Virtual Studio products, features correspondent Laura Burdon-Manley giving viewers a multilayered tour of the Holy Land and its significance to Christianity, Islam and Judaism. The circle shaped map, which appears to be on a raised platform on the studio floor that matches the look and feel of the studio set, has layers added as square portions of the map and individual buildings are showcased. Each segment is revealed separately as it is discussed. Throughout the nearly five minute segment, Burdon-Manley is able to walk around the map and “floating” layers as well. Her tour takes viewers through detailed views of specific parts of Jerusalem as well as locations throughout the region, showcasing the true power of augmented reality for storytelling.